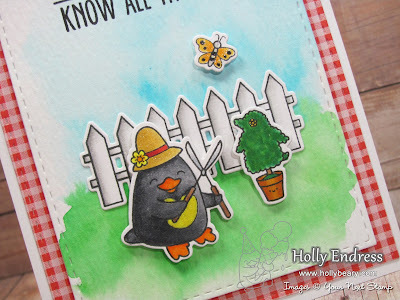 Hollybeary Creations : YNS June Release Sneak!! Hey everyone... It's time for the June Release Sneaks from Your Next Stamp. Be sure to head over to the blog to see a peek at some of the new stuff coming this Sunday to the Store! I'm using the fun new set Gardening Waddles for my Sneak card today. 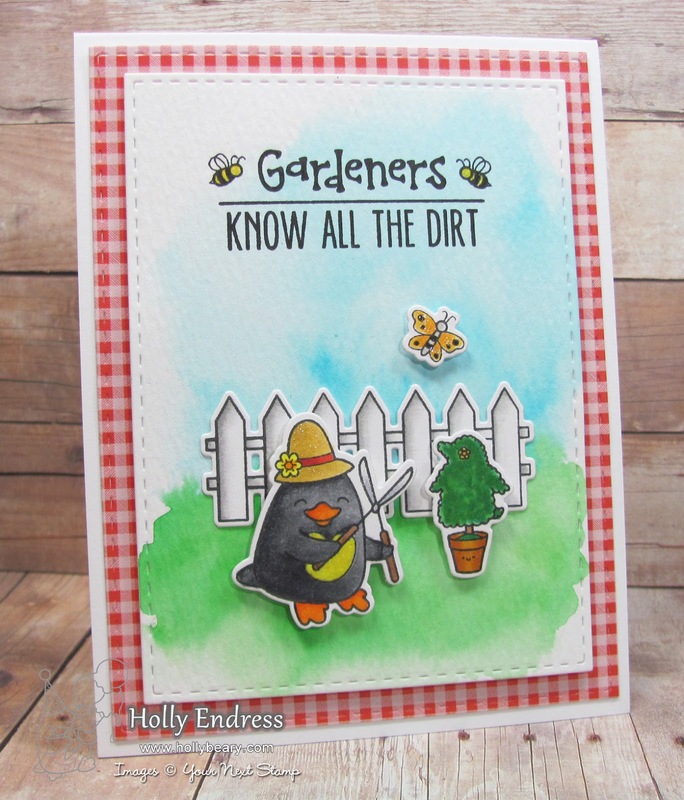 This is a super fun set that's perfect for anyone who loves to Garden or to make Retirement cards. It's full of fun images and some great sentiments. I started with a piece of watercolor paper and I added some color to the background with a Blue & Green Zig Clean Color Real Brush marker. I scribbled the marker onto the paper and then I added some water with a very damp paintbrush to move the color around. Once I had the desired look I die cut the panel with the Stitched Rectangle Dies. Then I die cut a piece of patter paper using the same dies and adhered the patter paper to a top folding card base. 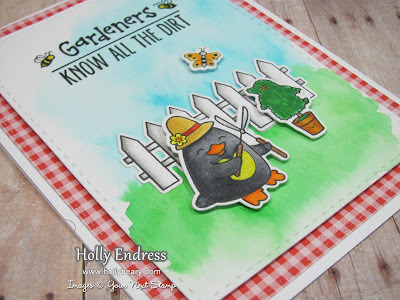 I stamped the sentiment onto the Image panel and colored in the bees with Copics. I added the panel over the Pattern Paper piece with some Foam tape. I stamped the images onto some White card stock and colored them in with Copics and then I die cut them using the coordinating dies. I adhered them to the main panel with some foam tape and some liquid glue. To add a bit of sparkle I added some Clear Wink of Stella to parts of the images. Head over to the YNS Blog for more sneaks and be sure to join us tomorrow at 10pm EST for the start of our New Release Blog Hop! 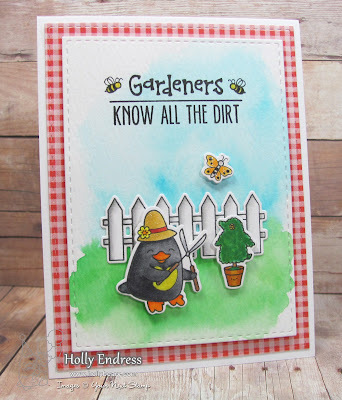 Gardeners do know all the dirt! Too cute! Such a cute card, I love the phrase its perfect! So cute!! Love the potted penguin. What a FUN image! Cute card. Love the fence image in this set. Really cute card! I love the gardening waddles stamp. Tfs and the chance to win the giveaway. Cards are so cute and very colorful.